An Iraq war comedy that “is everything that terrible conflict was not: beautifully planned and perfectly executed; funny and smart and lyrical; a triumph” (Darin Strauss, author of Half a Life). 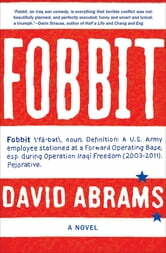 Fobbit ’fä-bit, noun. Definition: A US soldier stationed at a Forward Operating Base who avoids combat by remaining at the base, esp. during Operation Iraqi Freedom (2003–2011). Pejorative. In the satirical tradition of Catch-22 and M*A*S*H, Fobbit, a New York Times Notable Book, takes us into the chaotic world of Baghdad’s Forward Operating Base Triumph. The Forward Operating base, or FOB, is like the back-office of the battlefield—where people eat and sleep, and where a lot of soldiers have what looks suspiciously like a desk job. Male and female soldiers are trying to find an empty Porta Potty in which to get acquainted, grunts are playing Xbox and watching NASCAR between missions, and a lot of the senior staff are more concerned about getting to the chow hall in time for the Friday night all-you-can-eat seafood special than worrying about little things like military strategy. Darkly humorous and based on the author’s own experiences in Iraq, Fobbit is a fantastic debut that shows us a behind-the-scenes portrait of the real Iraq war.